So here we go guys! This collection is all about the 50s, 60s and 70s the lifestyle associated with this year and of course… THE MUSIC! This first chandelier is called Stanley! Stanley suspension fixture has a unique sculptural shape, it’s a versatile piece which gives a sophisticated and classy ambiance to any setting. It is indeed a style icon of the fifties and sixties. This vintage lamp’s structure is handmade in brass and the lampshades in aluminum it can have up to 5 movable arms! It screams “retro style” right guys?! This next piece name is “Norah”. Can´t you remember those fabulous 50´s songs already?This piece of delicate forms gives life to any space. It transmits elegance and purity, so simple and yet such a statement of good taste. Its structure is handmade in brass and the bulb holders in aluminum. The name: “Hendrix”, the purpose: to recreate history! Inspired, redesigned in the nostalgic vinyl player, a tribute to the jazz music and one of the most creative and influential musicians of the 70´s, we present you Hendrix ceiling lamp. This singular luminaire captures your attention letting you feel the acoustics of the bright Hendrix guitar and reminding us the high fidelity audio reproductions, the acoustic sound passing to a melody of beautiful effects and reflections on any sitting room and wide spaces, especially for low ceiling heights. Slam the guitar already guys! This chandelier is just incredible, a stand ovation to the legendary Jimmy Hendrix and his extraordinary talent! “Hanna” is a vintage suspension fixture which suits perfectly a living room. Its structure made in brass reports to a classical ambiance. This magnificent pendant lamp is elegantly composed by five arms and three lampshades made in aluminum by artisans who apply delicately an ancient technique called hand metal spinning. “Cosmo” is inspired by the space with all its galaxies and planets, you´ll have a piece of the universe hanging from your ceiling. 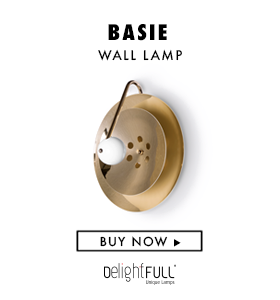 A dynamic piece full of energy and versatility, since all its spheres can rotate within 2 axis which enable it to cast light into any spot. The majestic lamp is composed of 11 illuminating spheres of different sizes. With expressive harmonic beauty, the “Clark” exudes a positive vibe. Constructed of brass tubing using the classic method of bending the brass twice into a rounded oblong shape allows for bright and load casts of light. Its structure is made in brass, covered by a golden bath just like real trumpets are. Let yourself be part of Clark ceiling ﬁxture, dare to change the way you see musically inspired lighting. If you think you saw everything in what concerns lighting, you’re absolutely wrong: “Charles” suspension came to show that there are no design boundaries for lighting design! It’s handmade copper plated body will turn any living room, dining room or lobby in the most royal setting you ever imagined. Its 20 glossy black lampshades will focus either the ceiling or the floor, providing an irresistible soft lighting. Back to art deco and again with musical inspiration, this time through the dramatic pipe organ, “Brubeck” ﬁxture is an instant classic sculptural design. An extravagant shape full of reﬁnement and modernity, 100% handmade in brass tubes it’s possible to create any shape or dimension: round, oval, square or rectangular to perfectly suit your dining table or hotel lobby. Like an orchestra, “Botti” embodies all the details of wind instruments and takes us into a music concert. Its structure is handmade in brass and gently covered by a golden mantle, a monumental piece which shows the exquisite capacity of Delightfull’s skilled artisans.